I don't know about you, but when I jet set somewhere I always get hungry. 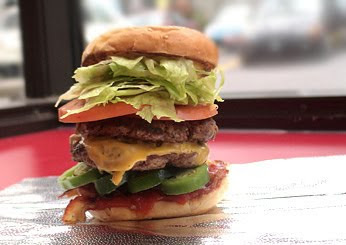 Whether it's before I get on the plane, or during a layover, I want something to eat at the airport, but sometimes the fast food joints don't cut it for me. I want a hearty meal that's halfway decent. So where should I go? Thanks to Food and Wine magazine (so glad I have a subscription- best investment ever!) I now know and wanted to share with all my jet setters. So if you are ever in any of these U.S. airports, just log onto Jet Set Smart and you'll find your suggestion for where you should eat in no time. 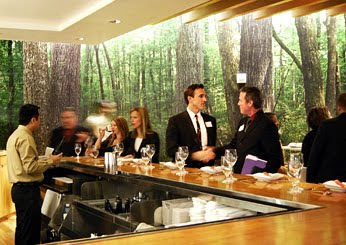 1- Hartsfield-Jackson Atlanta International Airport: One Flew South This sushi restaurant is Atlanta's first upscale airport restaurant, complete with a menu created by chefs Todd Richards and Duane Nutter of The Oakroom at the Seelbach Hilton in Kentucky (Terminal E, near Gate G6). 2- Los Angeles International Airport: Encounter Restaurant At the center of LAX is the 1961 Theme Building, a freestanding structure designed to look like a flying saucer. 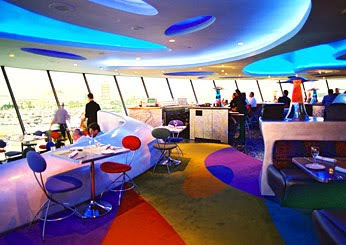 It's home to this space-age restaurant, known for 360-degree views, stylings stolen from The Jetsons and California-style dishes like organic salads and mushroom ravioli with grilled asparagus (Theme Building). 3- Newark Liberty International Airport: Vino Volo This growing chain of cushy airport wine bars serves small plates of cheese, cured meats, olives, and dishes like chilled paella and duck-confit-and-lentil salad. The food is available to go, and you can also order wines you've tasted for home delivery (Terminal C, Gate 73). 4- Philadelphia International Airport: Chickie's & Pete's The Philadelphia airport recently overhauled its main food court, adding an outlet of this lively South Philly crab house known for its chowder, steak sandwiches and "crab fries," or French fries seasoned with crab-boil seasoning and served with a creamy cheese dipping sauce (Terminal A-West). 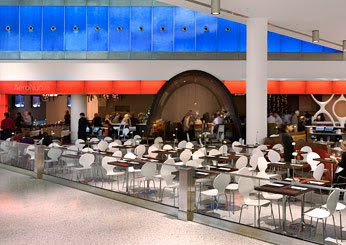 5- John F. Kennedy International Airport: AeroNuova JetBlue's Terminal 5 has nine full-service restaurants; the best is Aeronuova, an Italian restaurant created by New York City star chef Mark Ladner, with dishes like grilled Berkshire pork chops and warm radicchio bruschetta (Terminal 5, post-security). 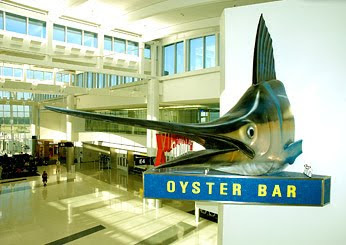 6- George Bush Intercontinental Airport: Pappadeaux Seafood Kitchen Like Louisiana, its neighbor to the east, Houston has its share of Cajun and Creole food. 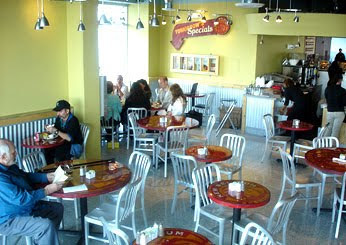 This regional chain serves gumbo, jambalaya, shrimp Creole and dirty rice (Terminal E, Gate 3). 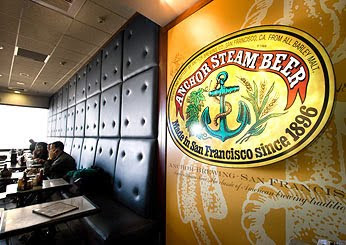 7- San Francisco International Airport: Anchor Brewing Company The famed San Francisco brewery's airport outpost serves the full range of its craft beers, including its Anchor Steam Beer, made using a unique brewing process that gives it the fruitiness of an ale and the rounded maltiness of a lager (Terminal 3, Gate 70). 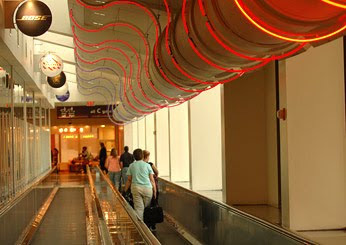 8- LaGuardia Airport: Figs Post-security, LaGuardia's terminals offer very few food options. 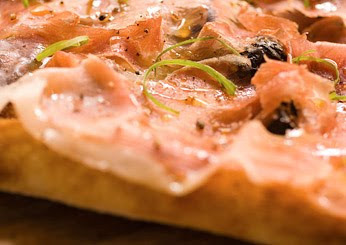 The most diverse selection can be found pre-security in the food court at the Central Terminal Building, where pizzas with toppings like fig and prosciutto (Central Terminal Building). 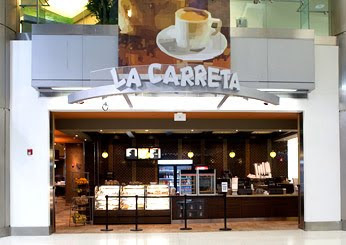 9- Miami International Airport: La Carreta The airport outpost of Miami's well-known Cuban chain is open 24 hours, serving favorites like pressed, portable French-bread sandwiches including the Cubano, made with roast pork, Swiss cheese and pickles, and the smaller medianoches ("midnight") made with ham, cheese and pickles (Terminal D, post-security). 10- Phoenix Sky Harbor International Airport: El Bravo Mother and daughter Carmen and Lorraine Othon's green-chile tamales have been drawing crowds to their El Bravo restaurant in Phoenix's Sunnyslope neighborhood for nearly 30 years. Now, Lorraine's daughter, Monique, serves those same tamales–prepared earlier that morning in the original location–at El Bravo's airport outpost (Terminal 4, near Gate D). 11- Logan International Airport:Bonfire This steakhouse in Boston's Terminal B and New York's JFK airport with dishes like fish tacos (Terminal B, American Airlines side, post-security). 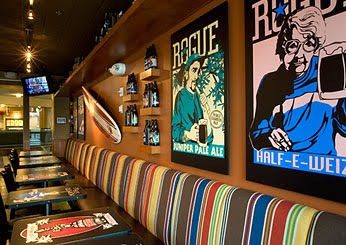 12- Portland International Airport: Rogue Ales Public House The funky Newport, Oregon, brewery Rogue produces some of the best craft beers in the country; it also has five Rogue Ale Public Houses–the one in the airport has eight Rogue ales on tap and gastropub dishes like Kobe beef burgers topped with local Rogue Creamery cheddar (Concourse D, post-security). 13- Charlotte-Douglas International Airport: Yadkin Valley Wine Bar This forward-thinking wine bar offers flights, glasses and bottles from North Carolina's growing Yadkin Valley wine region, including producers like Shelton and RagApple Lassie vineyards–and they'll ship, too (in the connector hallway between Terminals D and E). 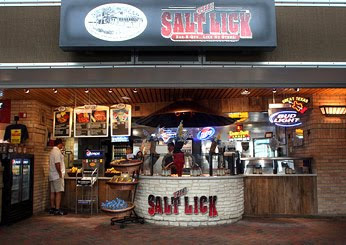 14- Austin-Bergstrom International Airport: Salt Lick The 40-year-old Driftwood, Texas, institution has brought its barbecue–most notably its supertender brisket–to Austin's airport (West Terminal across from Gate 12). 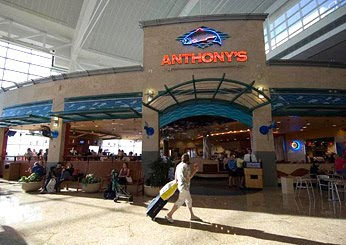 15- Seattle-Tacoma International Airport: Anthony's This regional restaurant chain in the Pacific Northwest is known for fresh local seafood and stunning views. 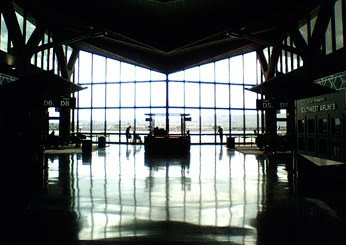 The Sea-Tac location is no exception, with dishes like Puget Sound oysters and the Olympic mountain range as a backdrop (Central Terminal). 16- Washington Dulles International Airport: Five Guy's Both Terminals A and B have branches of this Washington, DC-based chain, which makes skinny, flavorful burgers and hand-cut fries to order and offers free peanuts (Terminal A, Gate 3; Terminal B, Gate 71). 17- Chicago O'Hare International Airport: Berghoff Café O'Hare's coolest quick dining option: This outpost of the restaurant was opened by German brewer Herman Joseph Berghoff in the 1880s. 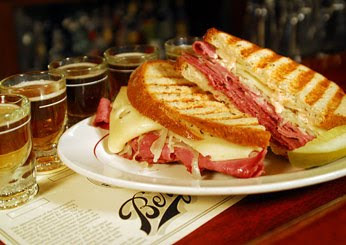 Beyond Berghoff's beer on tap and root beer, there are hand-carved roast beef, turkey and corned beef sandwiches and the house specialty: The Reuben (Terminal 1, Gate C26). 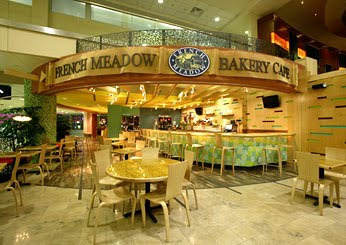 18- Minneapolis-St. Paul International Airport: French Meadow Bakery & Café The Minneapolis original bills itself as the longest continuously running certified organic bakery in the country; the airport outpost serves baked goods like warm apple crisp as well as savory dishes such as pan-seared walleye with Minnesota wild rice (The Mall across from Checkpoint 1). 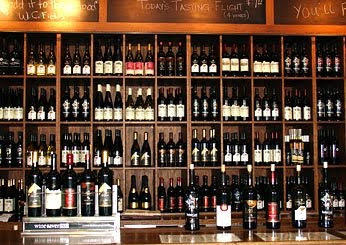 19- Dallas/Fort Worth International Airport: Cousin's Barbecue As with the Charlotte, North Carolina, airport, your best bets at the Dallas/Fort Worth International Airport are barbecue and local wines. 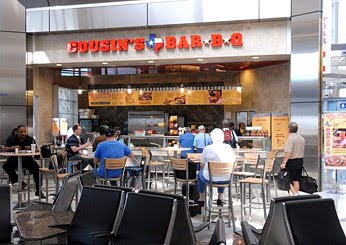 Cousin's offers Texas standards like smoked brisket, ribs, sausage and pinto beans (Terminal D, near Gate 28; Terminal B, Gate 27). 20- Denver International Airport: New Belgium Hub The Denver airport has half a dozen taverns featuring the state's microbrewed beers. This artsy bar and grill serves whole-wheat pancakes for breakfast, but also chicken sandwiches and oversize salads to pair with Fat Tire Amber Ale and other award-winning beers from New Belgium, a Fort Collins, Colorado brewery (Concourse B, Gate 80). Thank you and Food & wine magazine... what a great list! 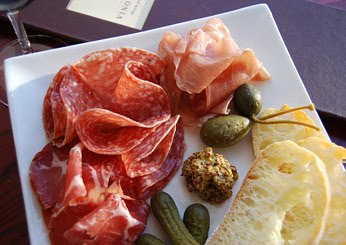 Love the pictures too, especially that vino volo meat/cheese platter, yum! 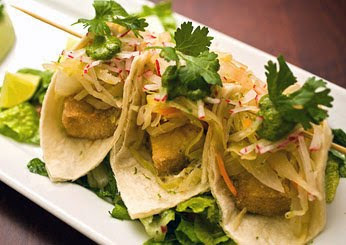 Can't wait for our next trip to do some 'research' at these restaurants... Cheers!